2. Stepping aside and finding yourself can be vital, especially after years of coexisting in a committed, long-term relationship. The very notion of "taking a break" from the one you love is often times misinterpreted as a somewhat cowardly way of ending the relationship without stating so bluntly for public consumption. In fact, what some refer to as one's "need for space from the partner" does appear to be a legitimate cry for just that -- space. It turns out that it's not just men who crave solitude and withdraw into that dark room to spend quiet time inside their so-called man cave. In this day and age, the traditional stigma that has long accompanied a couple's decision to take a break from their relationship is gradually fading as a thing of the past. It's become increasingly clear that deciding to give each other space does not necessarily equal breaking up in the direct sense of the term. At times, it can be a healthy option -- that is, of course, depending on how it is that one or both of the partners plan to spend their individual time apart. Based on my humble experience, I've come to discover eight simple advantages that go hand in hand with this difficult yet (more often than not) mutually beneficial decision for two people to step aside and regroup. 1. 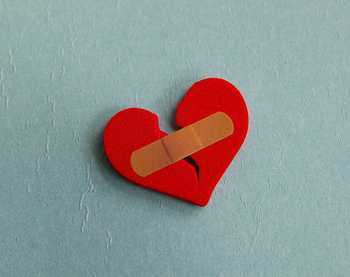 If the good old AAA (Apology, Affection and a promise of Action) fails to work, and a quick fix a la "sorry" and "I love you" turns out to be nothing more but a momentary band-aid, you know taking a break may just be the answer. 3. Give yourself and your partner the opportunity to let your heart(s) grow fonder. Ever miss the feeling of actually missing your other half? An emotion well worth revisiting, that's for sure! 4. Is the relationship becoming increasingly stormy? You no longer hear one another, you can hardly sustain a conversation without it erupting into a full blown fight within minutes... Yes, it may be worth looking into calming down and getting yourselves together individually before you can do so collectively. 5. Both time and distance have been known to refuel love and longing for one another. Simple but true. Again, absence does make the heart grow fonder. On the other hand, if during this time apart, you realize that you hardly ever miss your partner, it might be a clear sign that you may, sadly, be approaching the end of the long and winding road. Letting go may no longer be an option but instead, your only available solution. 6. Learning more about your loved one is, of course, invaluable for a healthy partnership (particularly as far as long-term relationships go.) But somewhere along the way, much like a vessel, we find ourselves falling deeper and deeper into our other half and their whole being, while inevitably losing touch with ourselves and our identity. Take this opportunity to return to your partner with a fresh set of eyes and ears. After all, the more you know about yourself, your expectations, desires and dreams, the more you're capable of bringing to the table as far as your relationship goes. 7. Taking a break does not mean going your separate ways and seeing other people. No, let's not confuse the two, OK? Taking a break is one thing -- breaking up, however, is a different matter altogether. 8. Being apart from your other half can truly show you what it is that you're missing when they're not beside you. Trial separation is not synonymous with lack of love and/or lack of desire to be with your significant other down the line. On the other hand, if the end result does, indeed, turn out to be a terminal break up as one or both of you decide to go your separate ways, bear in mind that it's probably for the best -- better now than later, right? Wait and see how long you can go without playing with her hair, caressing his neck, swapping stories at the end of a long day, waking her up with a fresh cup of coffee and that simple joy of fixing his favorite breakfast on Sunday morning. A trial separation does not have to resemble a painfully lonesome leave of absence. But be mindful not to let it drag on forever, either... You'll both know if and when it's time to get back together and embark on the next chapter of your journey! While this may be the answer for some, it may not necessarily mean anything to you and your relationship, for that matter. Is a quick band-aid a good enough fix for you? Well, my friend, all the more power to you! What's your take on taking a break?